Dental implants are the most pleasing aesthetic solution for replacing missing teeth. Dental implants are titanium tooth/root substitutes that are surgically placed in the jawbone and act as anchors to stabilize artificial teeth. They can replace one, some, or all missing teeth and help anchor dentures, crowns or bridges in place. Individuals with adequate bone level and density who are not prone to infection and can maintain stringent oral hygiene are good candidates according to the American Association of Oral and Maxillofacial Surgeons. Chronic problems, such as clenching, bruxism, or systemic diseases, such as diabetes, decrease the success rate for implants dramatically. Additionally, people who smoke or drink alcohol may not be good candidates. 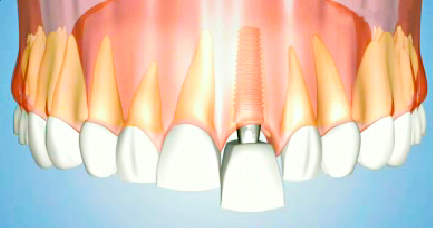 Implant treatment consists of two surgical stages and a restorative phase, generally over a period between 4-8 months. First, the implants are placed and buried in bone and allowed to heal for a period of 3-6 months. A second, simpler surgery is then needed to expose the implants for final restorations. The restorative treatment will follow with impression and fitting of the prostheses.